I have hosted many Crowdtap sample and share parties but this has to be the best one since the Ranch one I did last year. 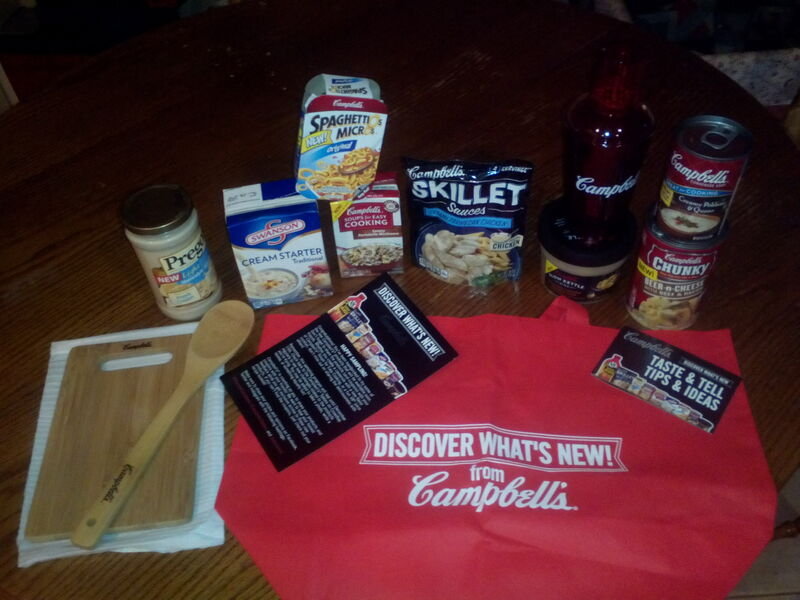 When I opened the box I could not believe how much stuff came with it, not only food, but you get a wooden soon, cutting board, cup with a shaker to attach a bag, plus all kinds of Campbell’s food products, : Beer n cheese soup with beef and bacon. (Hubby said their was too much bacon and thats shocking since he loves bacon.lol) You have skillet meal of Alfredo just add chicken. Their are soup starters to add flavor to homemade soups. micro spaghetti o’s that are in a microwave container. I am in love with these items I got, I have a lot of planning of what to make in the following days. Having parties is my speciality and the joy of trying new food is amazingly fantastic. There is a little bit of Variety of products from their soup collection, including a new chicken noodle soup with roast chicken and herbs with egg noodles in a slow kettle cooking.